We talk frequently about the importance of marketing your business. A lot goes into properly promoting a business. From developing a strategy, knowing your audience, engaging said audience, remaining consistent with the amount of content you provide and delivering high quality content, finding time to market your business may seem impossible. That’s why many businesses fail to do any marketing at all, or they settle for the bare minimum, which doesn’t get them anywhere. Thankfully, there is another solution–ask for help! Yes, we know–hearing a marketing company instructing you to get help marketing your business isn’t anything new. But there are many times when help is necessary because marketing isn’t a luxury–it’s a necessity! But we also understand that hiring a marketing company–even a company geared towards small business like Beacon–isn’t always a possibility. Delegate internally – Sometimes you don’t have to look too far for the help you need. Your current staff can help with marketing or with other tasks that will give you the time you need to handle the the marketing. Hire someone new – You can look to hire someone part- or full-time. Similar to above, this person can handle marketing tasks or other business tasks. Look to your past – Think of this as asking your past self for help. Review previously used content that might be applicable. You can read our blog about repurposing your old marketing content. Join a mastermind group or network – Masterminds or networks can provide valuable help and insight by giving you information, ideas, providing valuable feedback, and the ability to share experience you can learn from. Ask for a guest producer of content – Look to your strategic partners to see if they would mind producing some content for you. They will get increased exposure, and, if you provide content for them as well, you will also see an increase in audience. 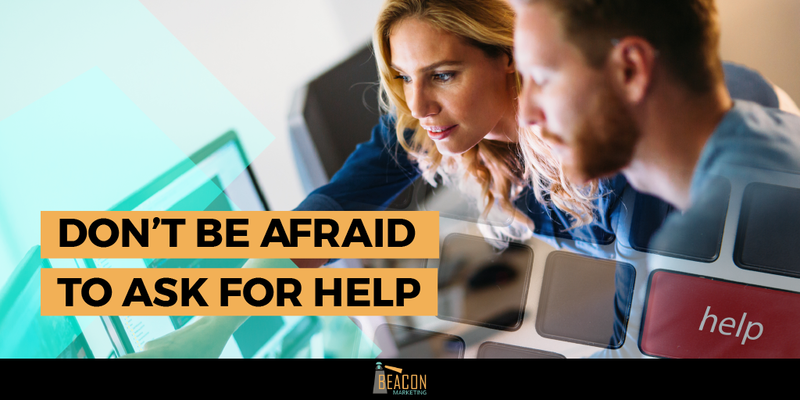 Hire external help – Marketing companies like Beacon are always a good option, but so are freelancers. With a bit of searching, you can find quality help on sites like Upwork or Thumbtack. Marketing is NOT a luxury, it is a necessary function of business. If you cannot find the time to market your business yourself, you must look for help somewhere. Analyze your short- and long-term goals so you can determine what you need and what would be the best way to seek the help you need to reach your goals. Also, don’t get discouraged if the help you seek does not seem to work at first. It may take some time and a couple of tries to figure exactly what you need. Stick with it and you will find the correct solution! Beacon Marketing would LOVE to be your marketing solution. We offer a FREE 60 minute consultation to help you figure out what you need and to help put you on the right path to make the correct decision for your business!